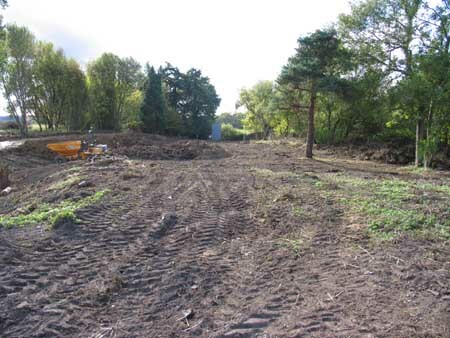 See also a trackbed tour from Kingscote to East Grinstead, the Interactive map of progress on the East Grinstead Extension, showing the extent of track laying, and photos showing the progress being made, and Lineside News. 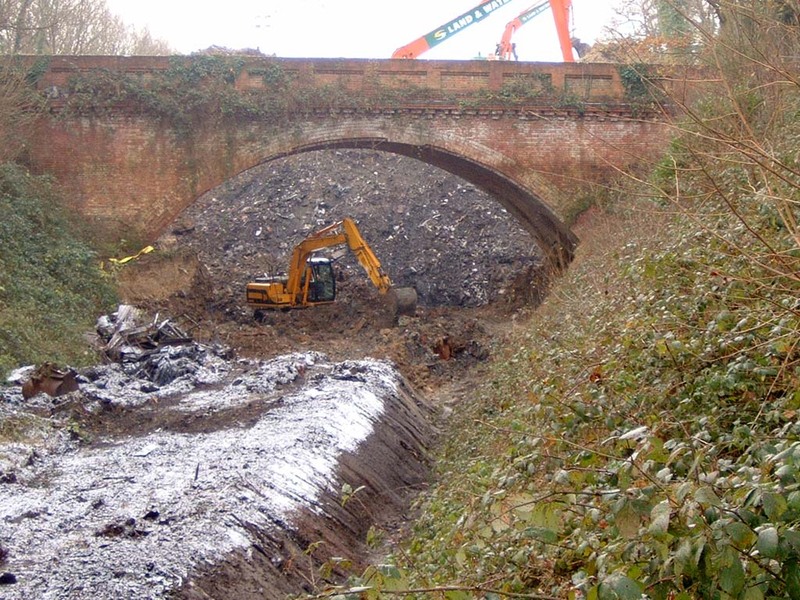 As part of the clearance work in the cutting at Imberhorne on the Bluebell's extension to East Grinstead, there is a further quantity of inert spoil material on the north side of Imberhorne Lane Bridge which we are able to move ourselves. 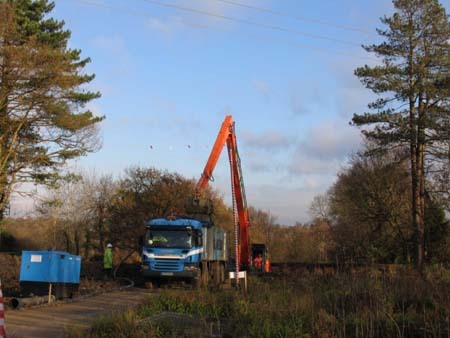 The material will be used for civil engineering purposes at other sites on the Railway. 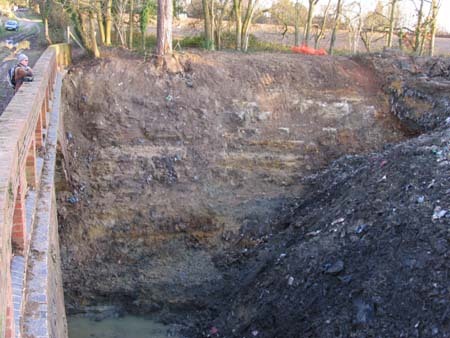 As with the material removed from south of Imberhorne Lane Bridge a couple of years ago, this is principally soil and sandstone, which, whilst adjacent to the main rubbish tip, is not part of it as such. 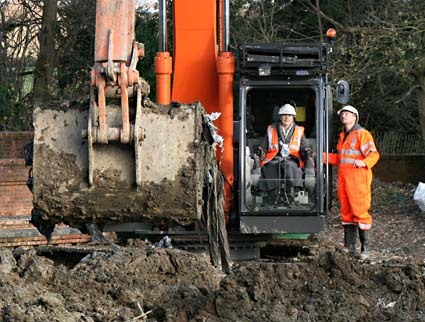 This excavation, funded from part of the proceeds of the Bluebell's 2008 share issue, will take place over the coming months, conveniently coinciding with the time of year when we are running very few other trains. With the railway's hired Class 08 diesel locomotive temporarily out of service, another locomotive has been taken on short-term hire to perform this duty. No.73136 'Perseverance' is owned by the Class 73 Locomotive Preservation Co Ltd, and will be on hire for two months starting in mid-January. Its greater performance compared with the 08 will enable it to run more round-trips each day, making better use of the other plant and manpower, and also ensure that the work can be completed within the required timescale. We have already removed about a tenth of the tip successfully, and this next phase of spoil removal gives us the opportunity to further shrink the obstacle. This has all been made possible by the share issue (for which money has continued to pour in over the last few days, in the run-up to the deadline at 3pm tomorrow). The removal of the remainder of the tip will also continue next year provided the planned fund-raising initiatives are well supported by Bluebell members and the wider public. 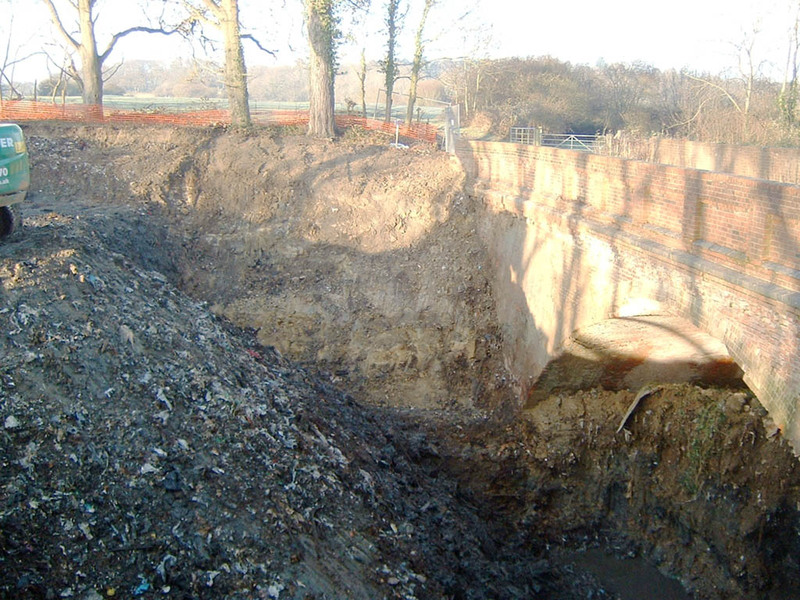 Report from Nigel Longdon of the successful completion of the trial phase of the digging out the former rubbish tip on the extension route. On Tuesday the final loads for the trial excavation left site. 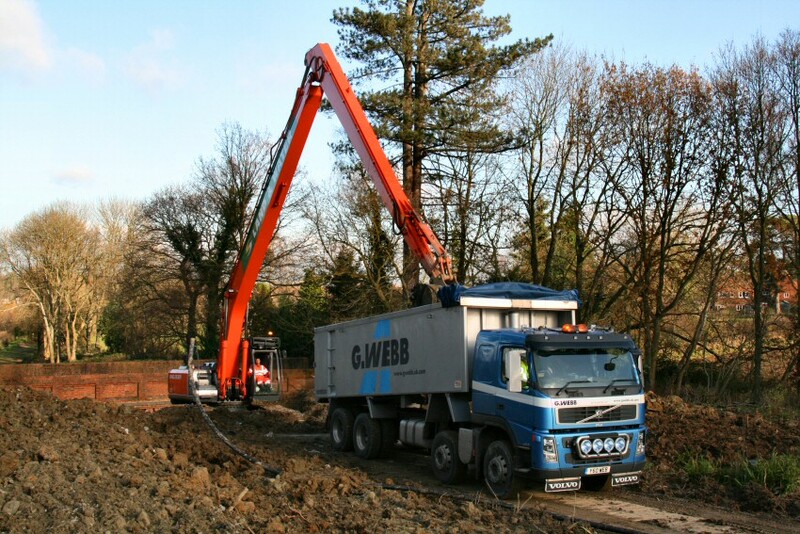 During the fourteen day trial 524 loads left site amounting to 10,386 tonnes of waste. 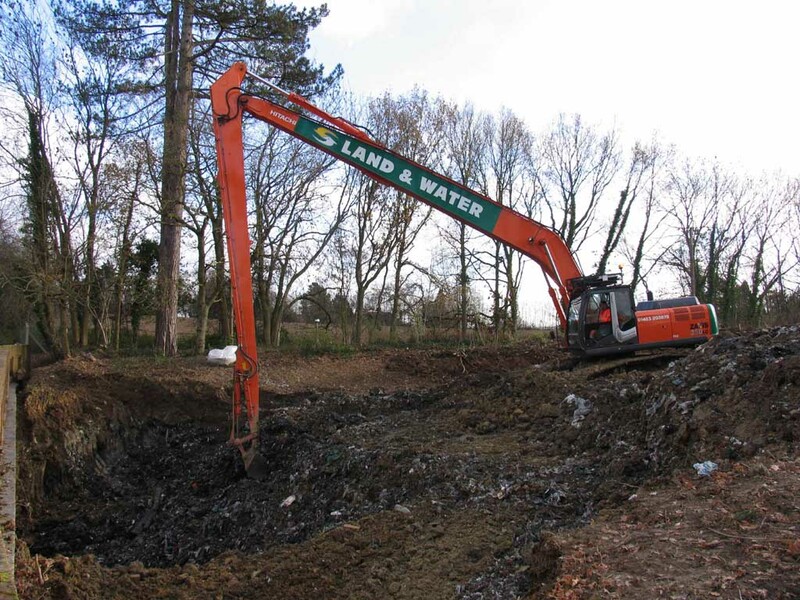 This trial has provided valuable information relating to the state of the waste, speed of excavation, transportation logistics and partnership working between Land & Water and Bluebell volunteers. 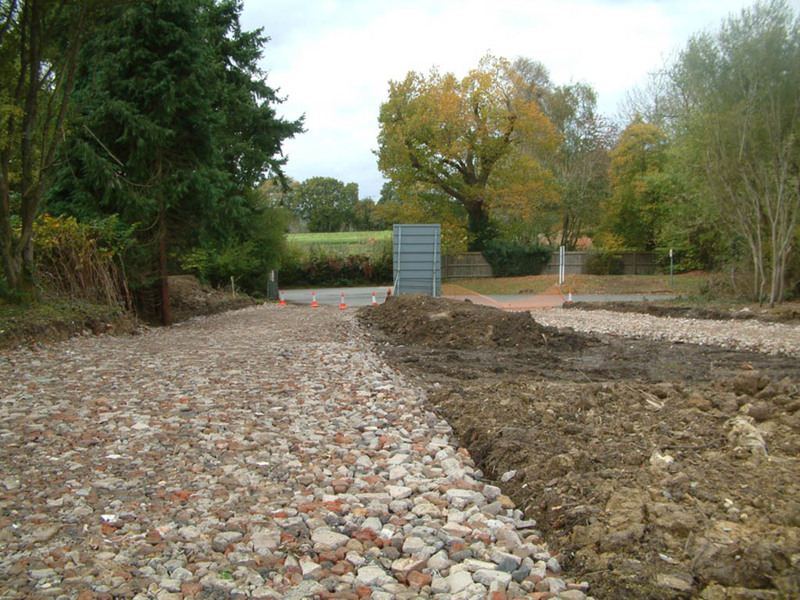 The capping clay has been reinstated and the site will now be mothballed. Phase 1 is now complete and funding will now be reviewed for Phase 2. The photographs (from John Sisley, left, and Andrew Strongitharm, right) show the progress that has been made in this relatively short time. 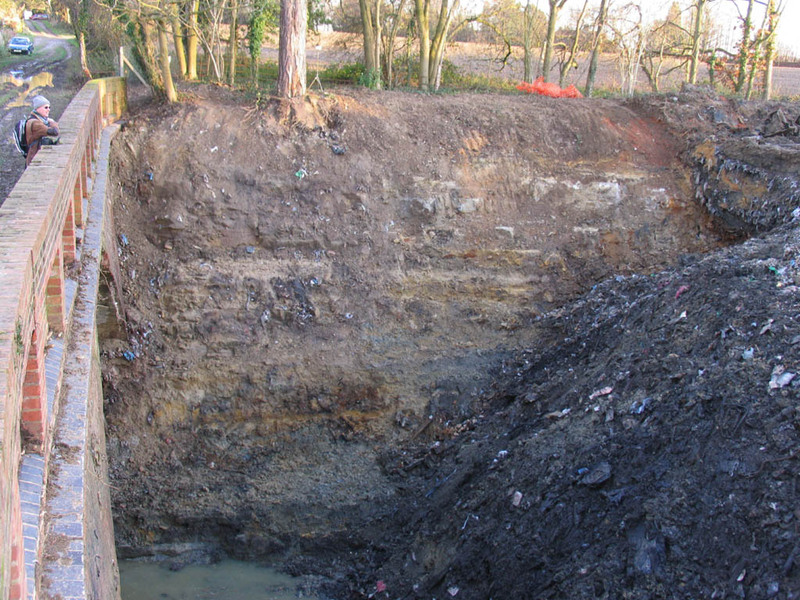 Report from Nigel Longdon from the third week of digging out the former rubbish tip on the extension route. This week we had twelve lorries in use. On Monday we achieved 45 loads, Tuesday 49, Wednesday 52, Thursday 47 and Friday 36. 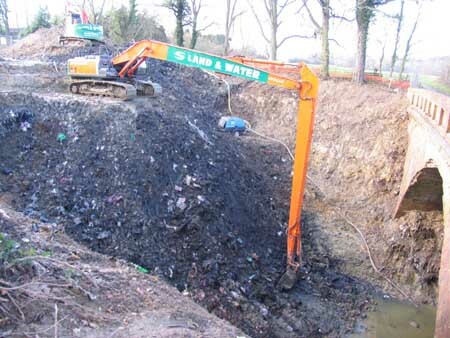 We are still using the Sevenoaks tip but also another near Henfield; the lorries being split between the two. 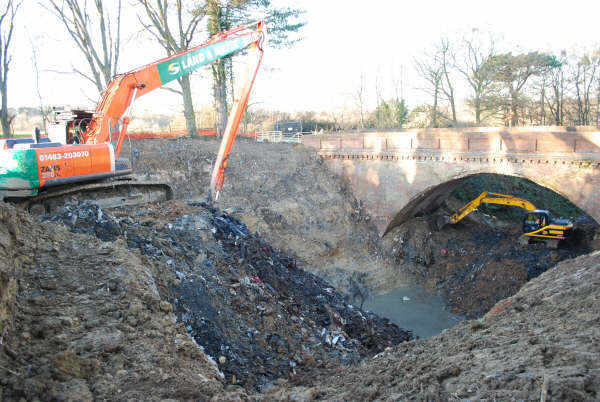 On Wednesday an additional excavator started moving spoil from under, and the trackbed north of, Hill Place bridge to within reach of the big excavator. 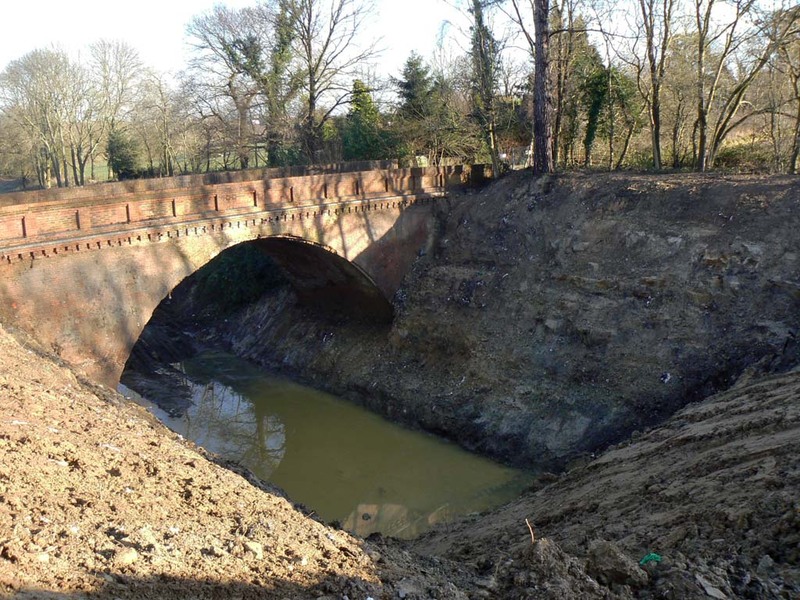 The two photographs are from the south of the bridge (Patrick Plane) and from the north (Michael Wilson) - a view that has not be seen for many years. A video showing the excavation work on the tip is available on YouTube from Martin Lawrence. Another report and photos from Nigel Longdon, from Friday. Today we achieved 28 loads; Fridays will usually be less as the drivers return home and are limited to their tachograph hours. 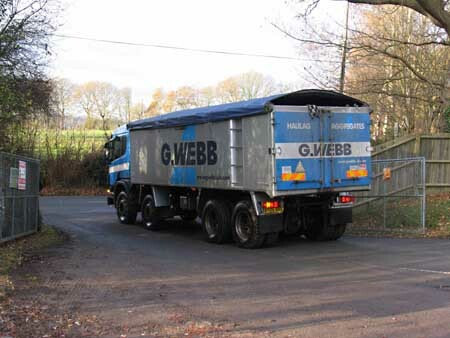 This still represents 3 loads per lorry apart from two. We have now reached trackbed level, although currently it is covered with water. Reports from this week from Nigel Longdon. 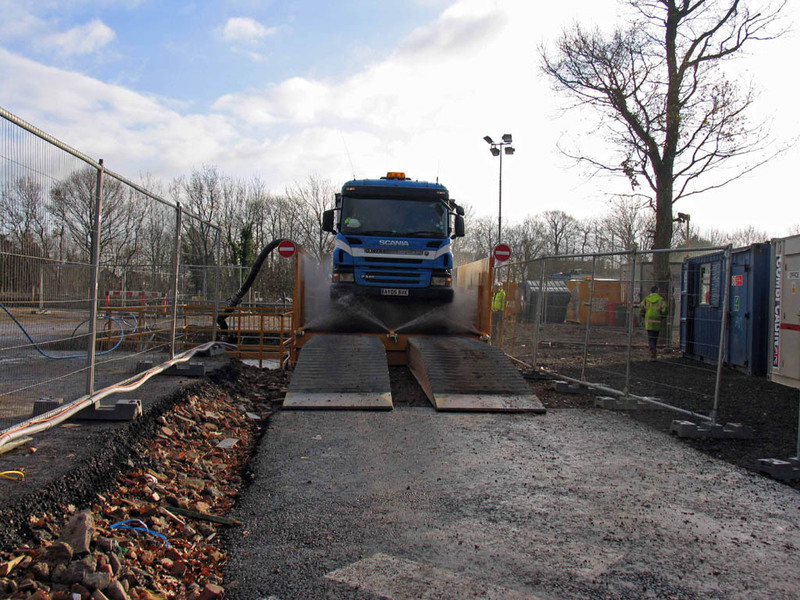 After a slow start last week the removal of waste from the tip is now in full swing and the daily number of loads is increasing - 34 on Monday 1st December and 38 on Tuesday. Ideally we'd like to move four loads each day per lorry. Towards the end of the day some loaded lorries leave site but unload the next morning: this is because the receiving site is open 07:00 - 16:00 and we have to operate 08:00 - 17:30. The excavators are working along the centre line of the tip from the north and the first part of the original cutting has been exposed. The photographs (taken by Patrick Plane) show the exposed Hill Place bridge and the original profile of the cutting plus the excavators hard at work. On Wednesday we used twelve lorries and achieved 46 loads - it would have been 48 but two lorries had punctures. 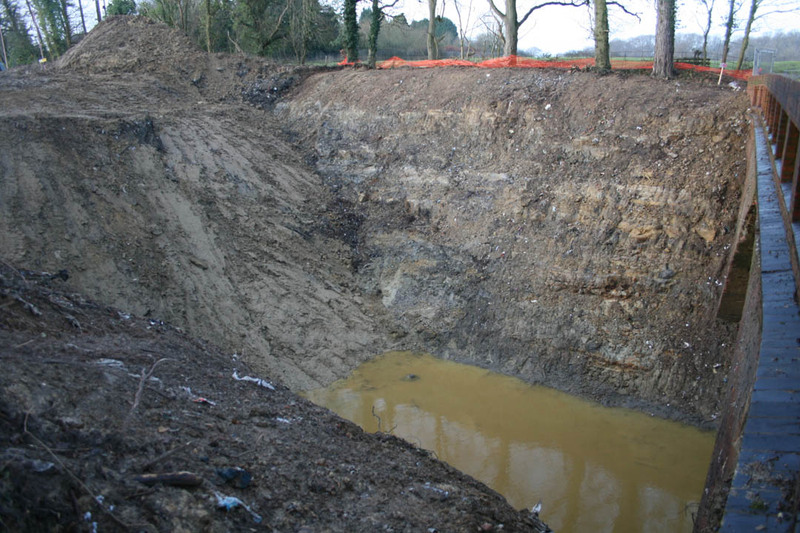 Today's photographs below (by Michael Wilson) show further exposure of the cutting sides. Thursday was less successful than Tuesday and Wednesday with 35 lorries: the M25 and A25 were affected by an accident, some lorries suffered punctures, and also one lorry returned to Cambridge for repair. Because of the problems with Sevenoaks, a tip northwest of Lewes was trialled today- it's about the same distance as Sevenoaks. It is planned to split the loads between Sevenoaks and Lewes on Friday. Thursday's two photographs (by Patrick Plane) show the hole slowly growing. 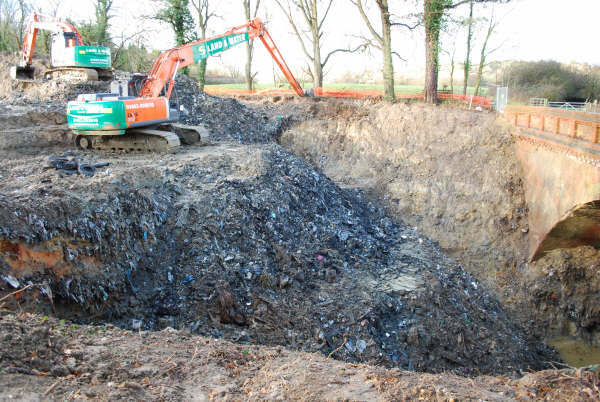 Yesterday was a landmark in Bluebell's history: Excavation of the cutting at Imberhorne started and invited guests witnessed Virginia Waddingham the Mayor of East Grinstead and Nicholas Owen each add a bucket of rubbish to one of the lorries. The photographs show the early morning queue of lorries (the drivers were undergoing an induction) and the first bucket load of waste being loaded. After being loaded the lorries pass through a wheel wash and complete the necessary paperwork (a task managed by Bluebell volunteers) then it's time for the first load to leave site destined for a site near Sevenoaks. Later in the morning the guests arrived, Bernard was interviewed, then Virginia Waddingham and Nicholas Owen each loaded a bucket of waste into a waiting lorry. The final picture shows the tip face. The plan is for the trial dig to continue, possibly for three weeks, then the face of the tip will be re-capped until further funds are available. Today work commenced on the next phase of the Bluebell Railway's project to reconnect the Railway with East Grinstead. 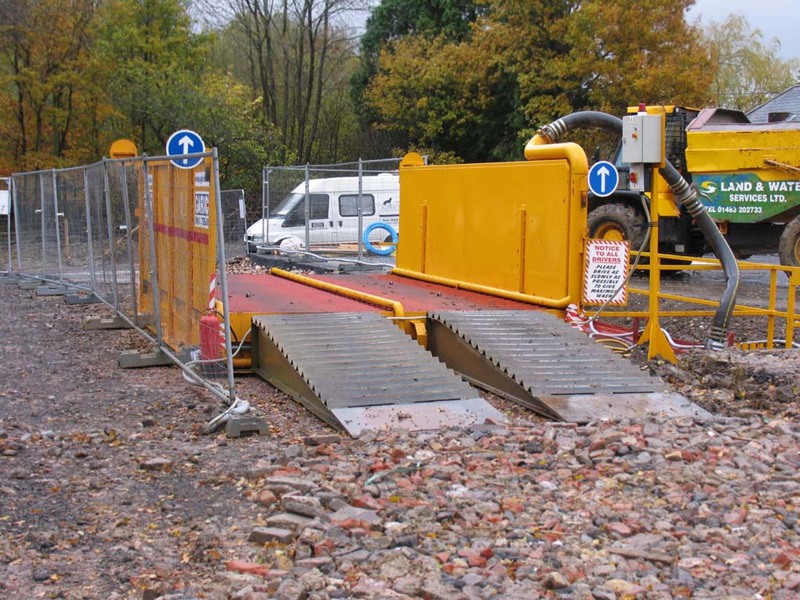 Blocking the route are thousands of tonnes of domestic waste, which were dumped in the Imberhorne Cutting in the 1960's and which must now be dug out at some considerable cost. The Mayor of East Grinstead, Councilor Ginnie Waddingham and Television Presenter Nicholas Owen, in the presence of local councilors and officers of the Railway will set the giant excavator to work on clearing the cutting, which is 500 metres long and 10-12 metres deep. The contractor, Land & Water Services will be operating their 25m-metre long reach excavator, a predecessor of which it used for work on the Channel Tunnel Rail Link. Initially, the clearance will only take place for a couple of weeks, as a trial to establish the needs when work commences in full next year. Infrastructure Director, Chris White said "This is a very exciting moment for us. It has taken many years of careful negotiation and preparation to get to this stage. We have carried out a lot of test drilling to see what material is there and putting together a methodology for its safe removal. At present the estimated cost is just that an estimate. This pilot run will enable us to make a more accurate prediction of exactly how much waste on a daily basis can be removed to landfill or sent for recycling, what it costs per day and how long absolute clearance is likely to take". "This really does mark the beginning of visible proof of just how serious the Bluebell Railway's intent to achieve its goal is, and that it will encourage even more people to support us", said Roy Watts, Chairman of the Bluebell Railway Preservation Society. "We are particularly hoping for support from the residents and businesses of East Grinstead as we believe that when the Railway terminates there it will bring economic benefit to the town". 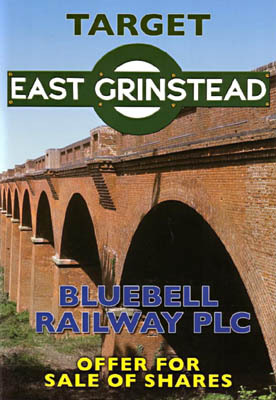 East Grinstead Town Mayor, Ginnie Waddingham said "East Grinstead Town Council are proud to support the Northern Extension project and know members have worked tirelessly to bring the Bluebell Railway home to East Grinstead. We are delighted that we have the opportunity to be here today to see clearance begin of this final hurdle and we wait in excited anticipation for the first steam train to return to our Town. The Town Council and the people of East Grinstead are very excited about the start of the excavation works". The pilot is being funded directly as a result of the Bluebell Railway's share offer which was launched this summer and which has raised almost £500,000. The Share Offer remains open until the 31st December. Anyone who wishes to receive a prospectus can obtain one by ringing 01825 720800 or by completing this on-line request form. A copy may also be collected from East Grinstead Museum. David Chappell's photos above show that Imberhorne is not the only work location at present. 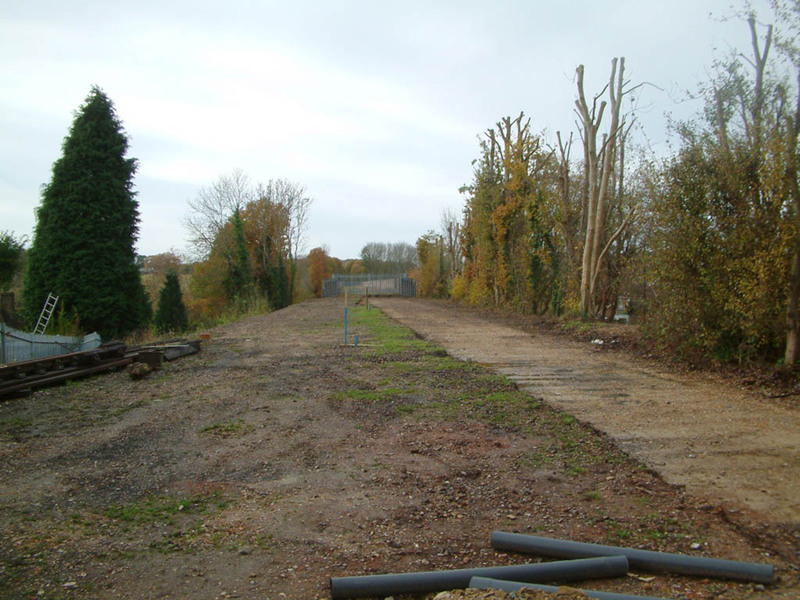 Our future station site at East Grinstead is being prepared for track laying; the second photo also shows that the viaduct remains secured by our security gates. Also our volunteer P-way gang were at the railway for an early morning delivery of 70 lengths of rail one Sunday recently, as we prepare for constructing the final phases of the extension. Work for the preparation of the site prior to excavation of the tip is continuing. 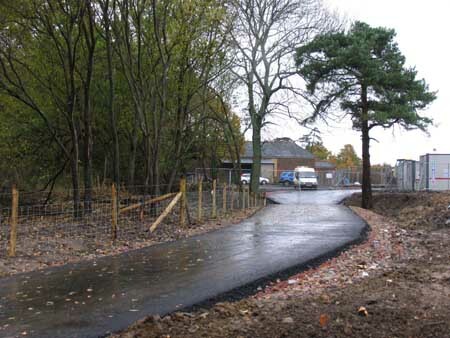 The access roads (Nigel Longdon's picture above shows the exit road), site compound and car park are complete and a wheel wash installed (Nigel's second picture above). A metal roadway across the tip remains to be installed. David Chappell's photos below, taken two weeks before, show the sub base for the access roads that have been constructed into our temporary compound at Imberhorne. Please note that the site remains accessible to authorised persons only, and people should not attempt to stop on the nearby road to attempt to view progress since this may harm our relations with our neighbours by obstructing the road. The following note reports on the Progress with the Share Issue, and the planned launch of the excavation later this month. The Share Offer has now raised £419,000. The site compound at the Imberhorne Bridge is under construction. 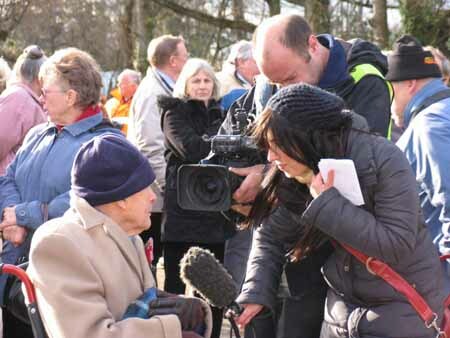 A major press publicity event is being organised to mark to the start of the actual excavation. 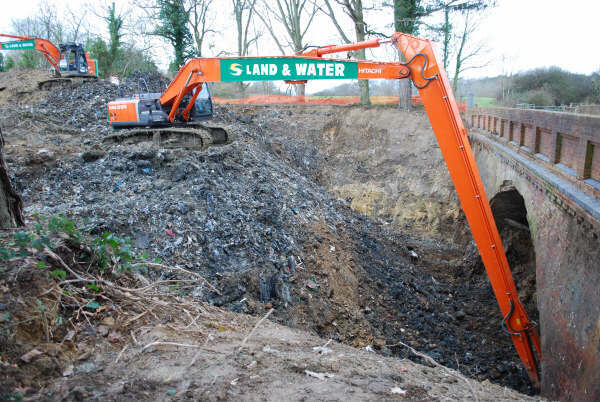 It is planned that TV Presenter Nicholas Owen and Councillor Virginia Waddington, the Mayor of East Grinstead will formally set the giant excavator into action. The event is by special arrangement with the contractors. 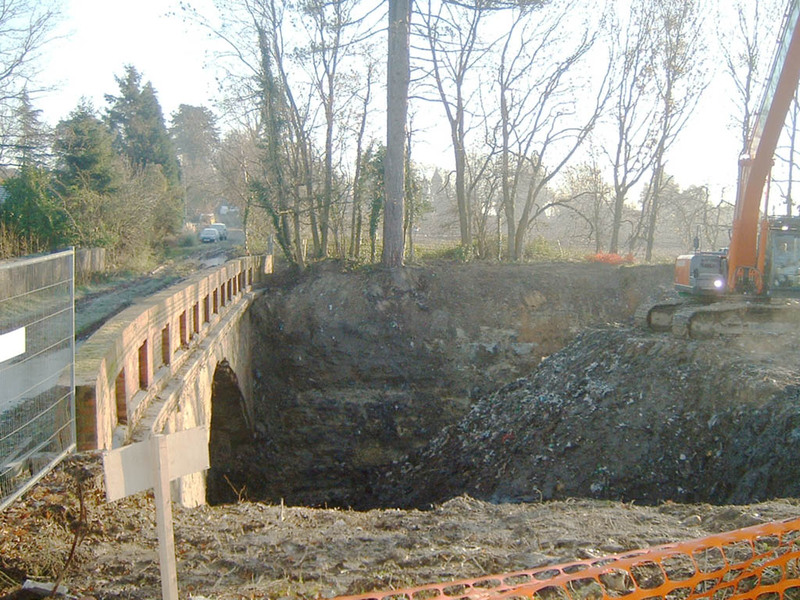 The site is not open to visitors at anytime and the excavation will not be visible from the road. Some of the remaining copies of the Share Prospectus are being delivered directly to homes in East Grinstead. There are plenty of copies available in the shop and the booking offices, for visitors to take away, or a copy may be requested through this on-line form. The length of time the excavation is continues in the New Year depends entirely on how many applications for shares are received in the next few weeks. The share offer closes at 3pm on New Year's Eve. 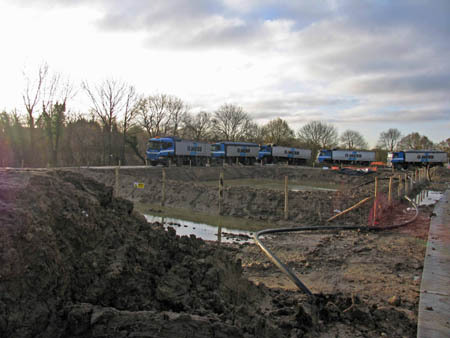 Temporary roads into and out of the temporary compound are being laid, and portacabins are on site ready for the start of excavation, expected later this month. 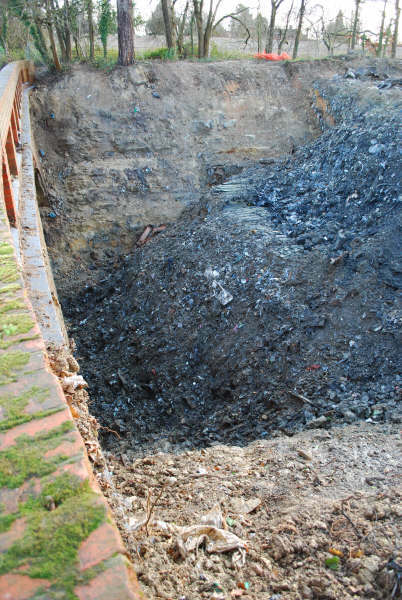 Details of the official start of the excavation of the tip will be announced once they are known. Any further share purchases in the coming weeks will enable greater progress in the initial phase of extraction - if you would like a prospectus for the share issue, it is available here. It is some time since I provided an update regarding progress on the Northern Extension Project; much has been happening. At East Grinstead further preparation is under way for the eventual construction of the platform and track layout. Initial service ducts have been laid below the planned link with Network Rail track and manholes are being built. A start has been made marking out the trackwork alignment. 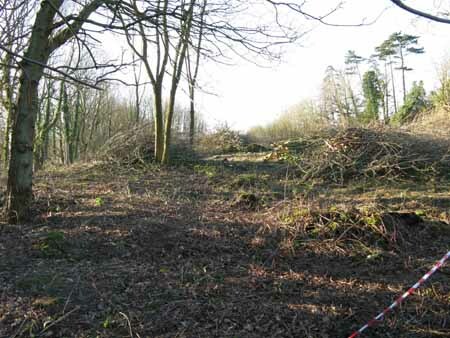 At Imberhorne the site earmarked for the access roads, site compound and car park required by the contractors removing the tip was cleared of vegetation in September. This week work commenced in grading the area ready for the construction of the access roads and other facilities (as seen in this photo). It remains a goal to have two week's trial excavation of the tip before the end of this year, subject to adequate finance and suitable weather. This site remains off-limits to all except those involved in the works. Sightseers are specifically asked to keep away as we are obliged not to obstruct access to the adjacent amenity site. 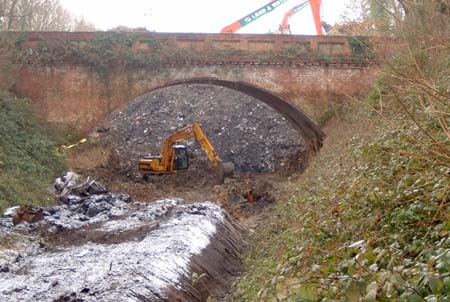 At the north end of the tip the south parapet wall of Hill Place bridge is being cleared of vegetation and soil to below the corbelling prior to the tip excavation being started and to enable the state of the brickwork to be inspected. 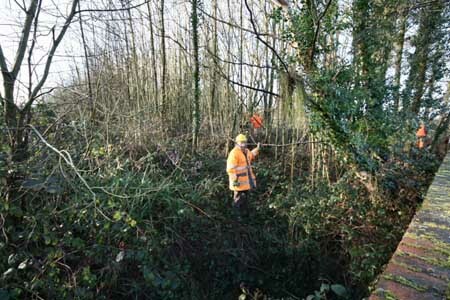 South of Imberhorne Lane bridge the vegetation is being cut back again, working towards Kingscote. 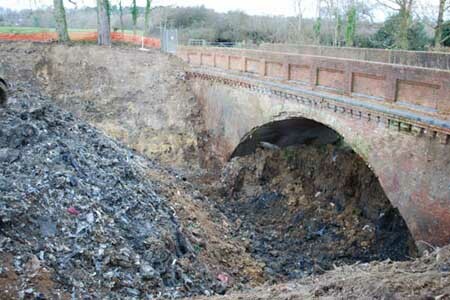 We hope to keep this in check as the opening of the line to East Grinstead approaches. As always we welcome new volunteers to the Saturday gang and there are opportunities for volunteers to undertake some roles during the excavation of the tip. If you are interested in either please contact me by e-mail. 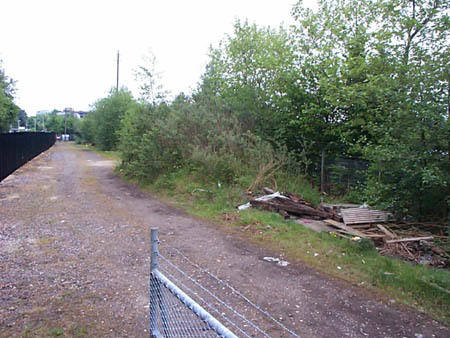 In September work will begin on construction of the site compound at Imberhorne Lane in readiness for removal of the waste contained in the cutting. 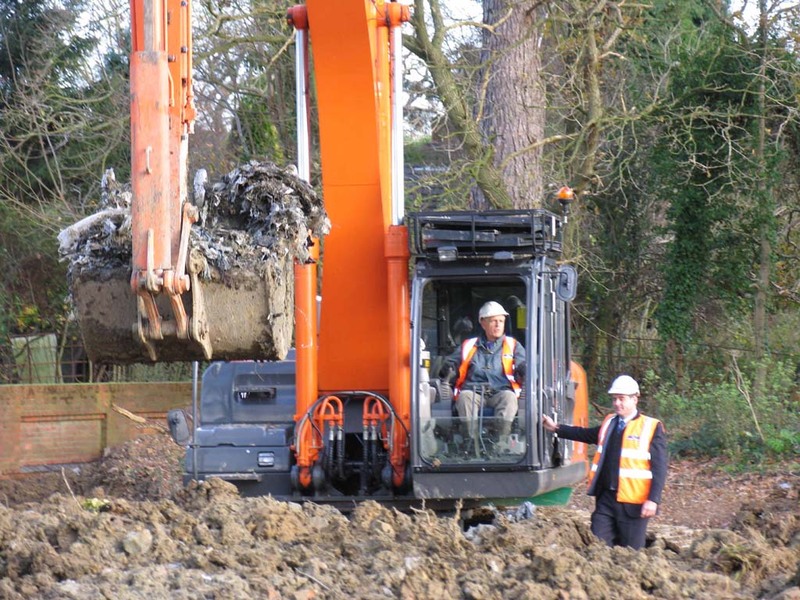 The work will be jointly undertaken by the Bluebell and our partner, contractor Land & Water Services, and will be followed by a pilot run of about two weeks of waste clearance. The press release, which explains what is planned in more detail is available here. 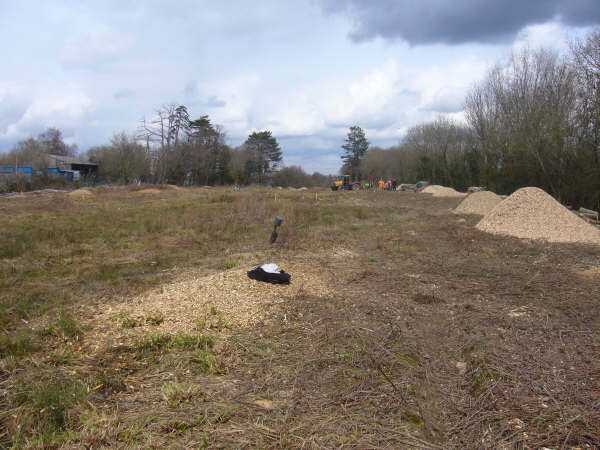 If any volunteers are interested in helping man the site compound there are a number of roles Bluebell can undertake thus saving considerable manning costs. These activities are being co-ordinated by Nigel Longdon (e-mail or 'phone: 020-8679 3732) & Ian Aitken so please contact them in the first instance for more information. The Bluebell Railway has launched a Share Offer to help raise the funds we need to extend the line through to East Grinstead. 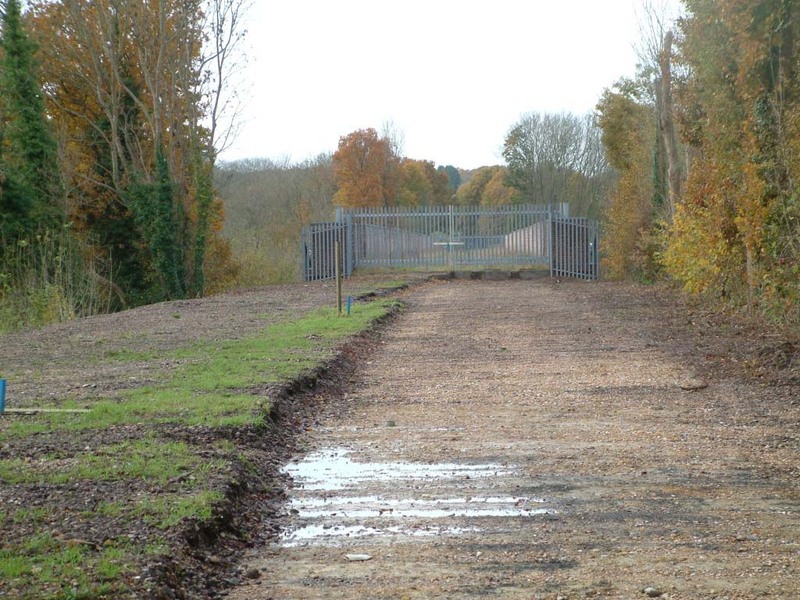 Network Rail recently fenced the area that they had been using at East Grinstead for engineering access which is now part of our station site. 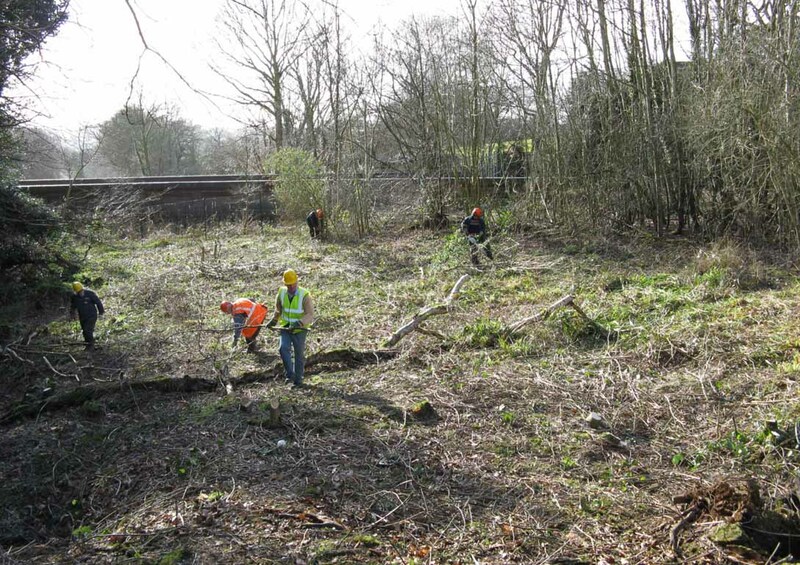 On Friday 16th May we commenced vegetation clearance which was completed two days later. 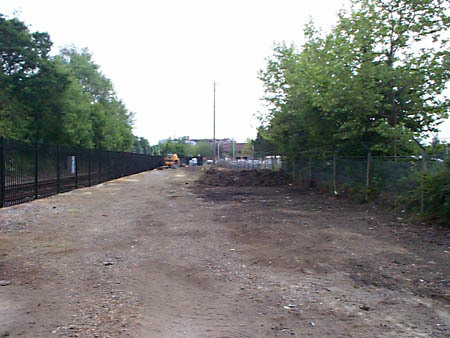 On Monday 19th May work started to clear the whole site as far as the viaduct and level the ground in preparation for marking out the station and track formation. 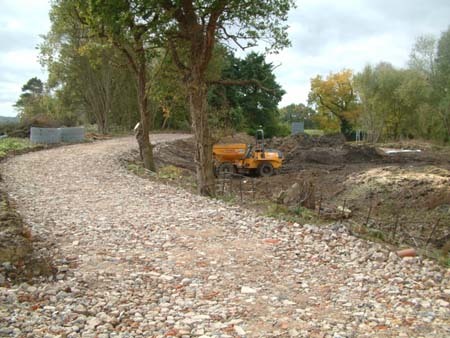 The photographs illustrate (left) the site as taken over - 16th May, and (right) the progress made by 24th May. After the cutting of vegetation the next task was to chip the brash and unusable logs. There were also a number of "large" trees that required the attention of professional tree surgeons. Despite using a chipper capable of taking wood to a diameter of at least 300mm this task took seven days and required a large number of volunteers to keep the machine working. All this work was completed within the period of ten weeks licensed by West Sussex County Council. The photo of the extent of the tip, after chipping was complete, is by Patrick Plane. That showing the larger of the chippers used, was taken on 20th March by Nigel Longdon. 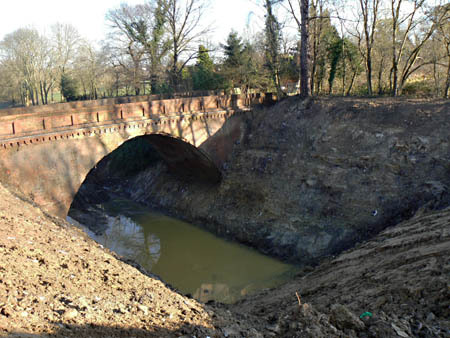 Chipping of the brash is now under way and should be completed by 20th March. After eleven working days (i.e. 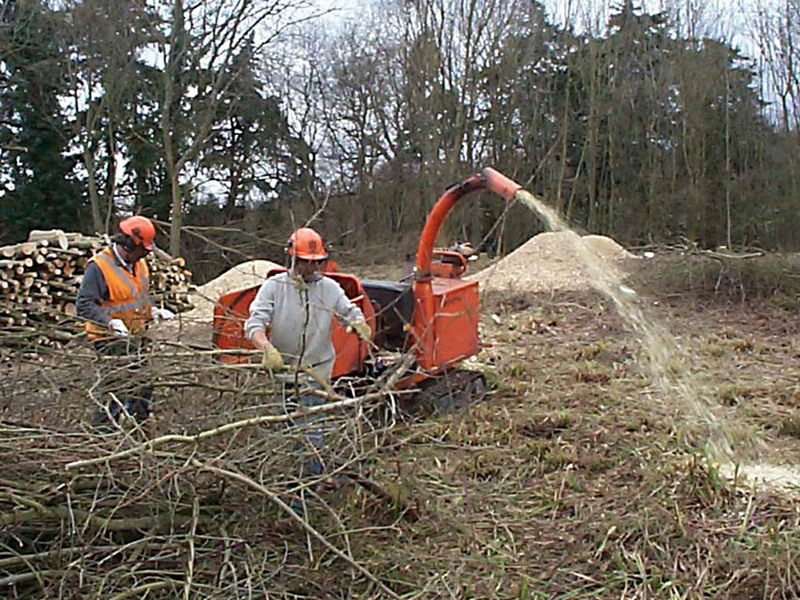 twice a week, for 5 and a half weeks) the clearance of vegetation on the tip is almost complete; well within the allocated period. Large trees that still need to be felled will be attended to by professional tree surgeons and the brash will be chipped during week commencing 17th March. All this would not have been possible without the tremendous volunteer support that we have received and the favourable weather - just one overcast working day during the whole period. 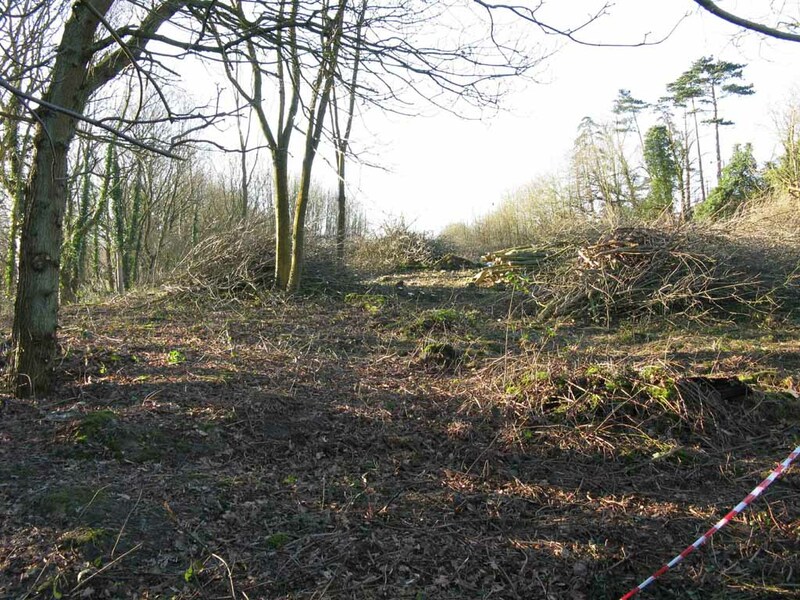 The photo on the right by Steve Fairweather shows clearance work in progress on 1st March. Please note that the site remains off-limits to all except authorised persons. Just over two weeks into the project to clear the vegetation on top of the tip and we have cleared in excess of 30% of the vegetation. Although this gives the impression that the job will be done well within the permitted ten weeks there is still much to do. 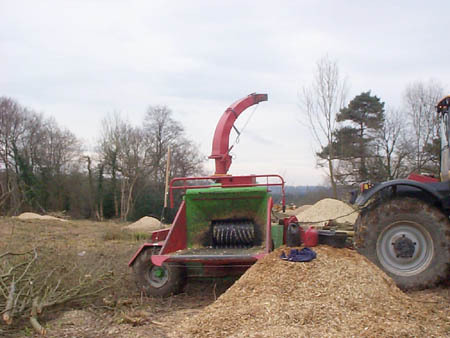 The waste has been piled up for processing (possibly using a chipper) as have the useable logs. There is also a difficult area to clear on the east boundary where the clay capping is up to three metres above the fence line. The terrain on top of the tip is quite wet and challenging in places. This is primarily the domain for the strimmer operators and Wellingtons are a necessity. Photos: Before (30 January) by Jon Bowers and After (9 February) by Steve Fairweather. A pattern of working has developed concentrating on Wednesdays and Saturdays with an average of about fifteen volunteers each day. Further assistance will be welcome - contact Nigel Longdon (by e-mail or 'phone: 020-8679 3732). Please remember this site continues to be restricted to those participating in the official working parties. Chris White, Bluebell Railway Infrastructure Director, is pleased to announce that West Sussex County Council will shortly issue a licence authorising the clearance of vegetation and trees on the tip between Imberhorne Lane and Hill Place Farm occupation bridge in preparation for the eventual excavation of the cutting. The licence will cover the period 28th January until 6th April 2008 and is subject to strict conditions. For this reason there will be no unauthorised work on or access to the tip. All work will be supervised by the two Team Leaders, Ian Aitken and Nigel Longdon. It is planned that regular working parties will be held on Wednesdays and Saturdays plus two other weekdays. If you are interested in assisting with this project please contact Nigel Longdon (by e-mail or 'phone: 020-8679 3732). 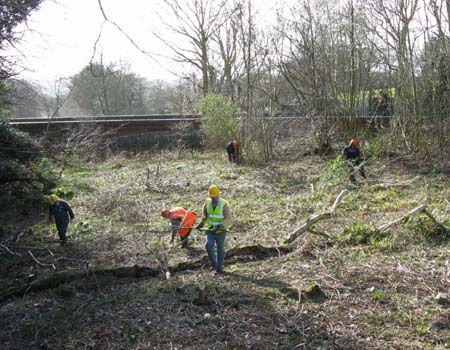 Volunteers must be members of the Bluebell Railway Preservation Society. Page maintained by Richard Salmon with thanks to Nigel Longdon, Avril Gaynor, David Chappell, John Sisley, Andrew Strongitharm, Steve Fairweather, Jon Bowers, Chris White, Roger Kelly, Patrick Plane and Michael Wilson.